Written by leading authors in the field, this clear and highly accessible volume provides full coverage of the topics commonly found in the contract law syllabus, alongside up-to-date illustrative case examples and stimulating commentary. Composed of approximately one-quarter authors’ commentaries and three-quarters cases and materials, including academics’ articles and extracts from books and Law Commission papers, this book takes account of a variety of theoretical perspectives, including economic, relational and empirical conceptions of the law. ● a companion website that provides skills materials and self-assessment tasks to help further your learning. 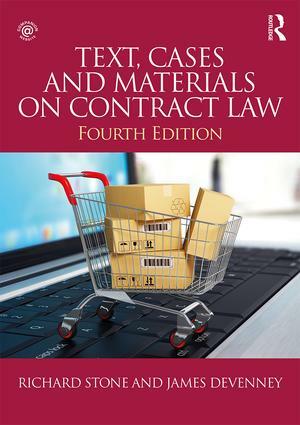 The range of material covered, straightforward style and targeted updates to this fourth edition make Text, Cases and Materials on Contract Law a comprehensive and invaluable resource for all undergraduate and postgraduate students of contract law. Richard Stone is Emeritus Professor of Law and Human Rights at the University of Lincoln, UK. James Devenney is McCann FitzGerald Chair in International Law and Business at UCD Sutherland School of Law, University College Dublin, Ireland.